News and documentary Emmy award, won by the long-running ABC news magazine show ''20/20'' for outstanding individual achievement. 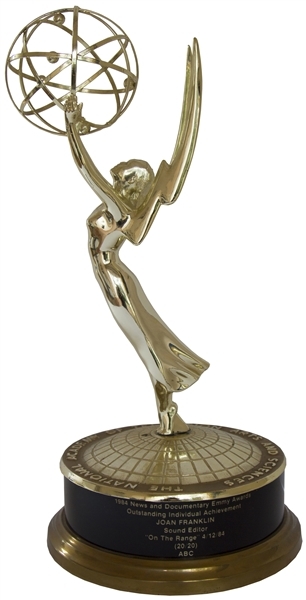 The Emmy's iconic winged woman holding an atom stands on the slightly convex, grid-lined surface of a round metal base, plated in 18-karat gold. The base's flat perimeter reads ''The National Academy of Television Arts & Sciences''. Front section is engraved with 7 lines naming the award, its category and recipient: ''1984 News And Documentary Emmy Awards / Outstanding Individual Achievement / Joan Franklin / Sound Editor / 'On The Range' 4/12/84 / (20/20) / ABC''. Measures 15.25'' in total height with a 7.5'' diameter base. Weighs 6 lbs., 2 oz. Slight discoloration on the base and indiscernible repair to base at feet, overall very good to near fine condition.